5e is a lot crunchier than most of the other stuff we’ve played, and some of our players only play with our group, so I got everyone to do their character generation prior to to con. Which meant I could prepare with things like making sure the story fit the characters, and that I was bringing things like the right props (spell cards and so on). And, well. It also meant I could do some fun character sheets, which you can see above. The base sheet is from John Grümph, and I chose it because, a) I think it looks rad, and b) it’s one of the less “crunchy” feeling sheets; I think it manages to convey enough information without getting bogged down in too many stat blocks. 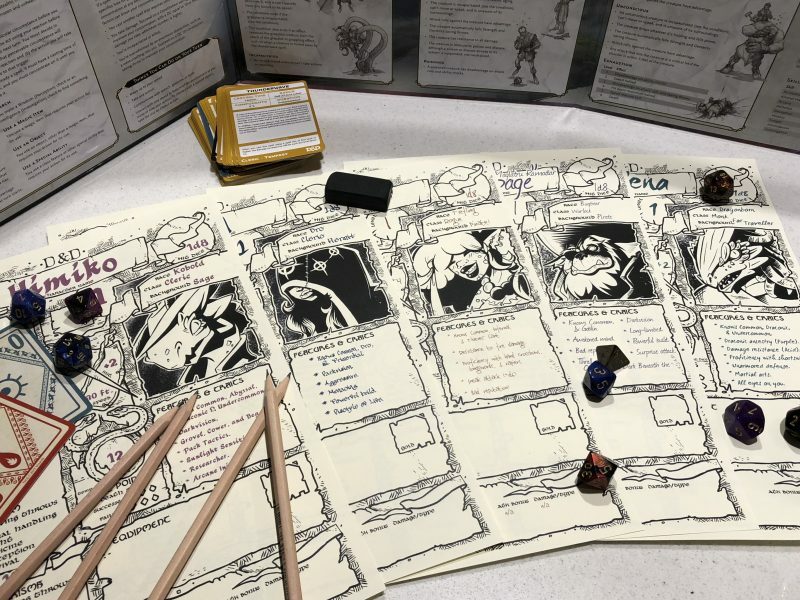 I ended up printing out little four-page packs for everyone; character sheet on top, then a sheet describing their race/class/background abilities, a page of weapon stats (so I didn’t need to lug huge rule books around), and a note-taking sheet. I clipped them onto backing boards with a transparency sheet on top, with the idea that people could track stuff like HP on the transparency with whiteboard markers rather than having to write on their nice print-outs. I think it worked out pretty well, in the end, so high-five me. The game itself was kind of a “kidnapped and locked in a dungeon, now escape!” ontological mystery style thing. I wasn’t quite organised enough to design the final boss battle (time, where even does that go), and the group missed the tame-a-mimic-and-make-it-your-pet encounter which, I won’t lie, I was pretty bummed about. But all-in-all I think it went okay, the group escaped, no one died, and only one person was possessed by a demon. So, yanno. Not bad at all.